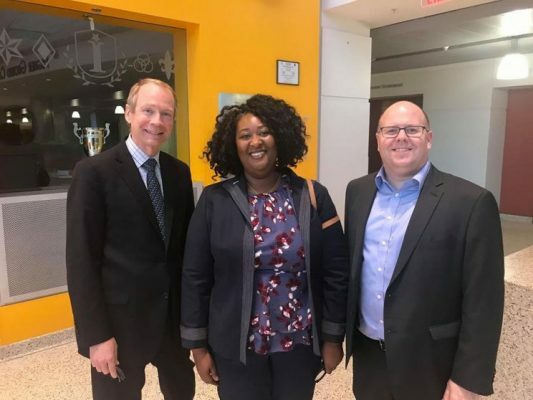 Whitman School Dean Gene Anderson; Tamu Brown-Hutchinson, president of the National Black MBA Association, Western New York Chapter; and Whitman School Associate Dean for Undergraduate and Master’s Education Alex McKelvie at the reception to celebrate the recent partnership. In March, the Whitman School held a reception to celebrate its recent partnership with the National Black MBA Association (NBMBAA) as part of the Collegiate Partnership Program. The event provided an opportunity for students, faculty and staff to connect with members of NBMBAA, network and openly discuss how to further the partnership in order to create a more diverse and inclusive environment within the Whitman School. According to Alex McKelvie, associate dean for undergraduate and master’s education at the Whitman School, the organization’s partnership with the Whitman School is multi-faceted, including merit-based scholarships, school-sponsored competition teams and career development opportunities. Story by Julia Fiedler, digital content developer in the Whitman School.